MEGA review from BestBackups, looking at pricing, security, features, customer service and ease of use. MEGA offers a generous free online storage plan with 50MB of space on offer, although bandwidth caps are a major turn off. Although controversy related to founder Kim Dotcom’s involvement may raise a few eyebrows, good security features are a powerful draw. You can read a detailed review below or sign up now. MEGA has one of the largest free plans on the market, offering 50GB of space completely free of charge. As with all of their accounts, there is a bandwidth cap, and for free users this is dynamic – you can’t exceed 10GB at any time, but that allowance is refilled every 30 minutes so long as you’re logged into your account. As you might expect, such a small cap can really slow things down, and is likely to put off a lot of users. However, if you don’t have too many large files to transfer then the lure of so much free space might outweigh its disadvantages. Should you decide to upgrade, there are four paid plans to choose from. At the lower end, a Lite subscription gives you 200GB of space and 1TB of bandwidth for 4.99 Euros (around $5.35*) per month. If you’re looking for a larger allowance, a PRO I account will give you 500GB plus 2TB of bandwidth for 9.99 Euros (approx. $10.75) per month and a PRO II offers 2TB and 4TB of bandwidth for 19.99 Euros (approx. $21.45) per month. At the top end of the scale, signing up for PRO III will set you back 29.99 Euros (approx. $32.20) per month in exchange for 2TB of space and 4TB of bandwidth. There’s also an added bonus if you decide to pay for a year upfront, as you’ll receive a discount of two months’ worth of fees. MEGA’s stringent security measures mean that there’s no business subscription available, on the grounds that sharing files openly among multiple employees is inherently insecure. Instead, companies are encouraged to set up all of their users with their own individual accounts. If you’d like to sign up for a paid account, you can pay by credit or debit card, as well as by wire transfer, or using Bitcoin or Paysafecard. You can also make a mobile payment using Fortumo or Centili. It’s rare to find a provider that doesn’t insist that payments are made by credit or debit card, so if you prefer to keep your purchases anonymous, MEGA is a smart choice. * Currency conversions are based on the exchange rate at the time of writing. MEGA, which stands for MEGA Encrypted Global Access, was created in 2013 by Kim Dotcom; the infamous founder of file hosting site Megaupload. Although a controversial figure whose practices have been brought into question many times, Dotcom’s project successfully gained widespread support, and MEGA, which has moved away from file hosting and into Cloud storage, is now used by more than 15 million people around the world. In recent months, however, Dotcom has distanced himself from the site, claiming that new investors are failing to protect the company’s founding principles. Whether this is the result of a personal dispute or legitimate concerns is a contentious issue, but it does appear that MEGA may be changing direction in the months to come. Although MEGA offers its users larger than average storage allowances, there’s no option to run automated backups of everything on your hard drive, or even to schedule scans for new data. Instead, you’ll need to select all of the files that you want to upload manually, and update them yourself when significant alterations have been made. It’s possible to utilise the majority of MEGA features exclusively from your web browser, with no need to download any software at all. Backing up and restoring data, sharing files and managing your account can all be performed online, although certain processes such as uploading folders and downloading large files work better in specific browsers, primarily Google Chrome and Opera. Apart from this, there are no limitations placed on the type or size of files that you can store with MEGA, although of course their bandwidth limits will keep you in something of a chokehold. You can also work around browser limitations and increase MEGA’s performance by downloading the MEGAsync app, or their browser extensions for Chrome and Firefox. If you’re not sure whether MEGA is the best choice for you, you can give it a try before you even register an account, so you don’t have to hand over any personal details until you’re sure you want to proceed. Any data you upload before registering will be retained for two weeks and automatically transferred to your account if you choose to open one, or deleted if you don’t. Another point worth noting is that, in accordance with their hands-off policy, MEGA does not automatically perform any automatic checks on whether the files you are uploading already have duplicates in storage. This means that if you backup a file that already exists in your Cloud storage, you’ll just get two copies of it. If this is a problem, you can allow MEGA to skip over files that already exist by selecting ‘Yes’ in the ‘Skip identical files’ section of your account settings. Finally, accounts that are not used for long periods of time may be deleted, although MEGA will send several warnings in advance, giving you the opportunity to revive the account or close it officially after removing any personal data. All of MEGA’s subscriptions include a monthly bandwidth limit, with the exception of their free account, which has a dynamic cap. For those not familiar with what this means, your bandwidth allowance is the amount of data that can travel between your computer and the MEGA servers at any one time. It’s not exactly the same as your file transfer speed, but more bandwidth will give the impression that uploads and downloads are running quicker. There’s an excellent explanation on TechTerms if you’d like to know more. Capping bandwidth is an unusual decision in the world of online backups, and is likely to put a lot of people off MEGA’s service. Although pairing it with such a large free storage allowance does soften the blow slightly, the restriction still feels unnecessary and invasive. In an attempt to make things less uncomfortable, MEGA is planning to implement a policy in the coming months that allows Pro users to draw on bandwidth beyond that which automatically comes with their accounts. Users can utilise this themselves, or assign it to third party users that have been granted access to their data (including those without a MEGA account). MEGA is compatible with Windows, Mac and Linux operating systems, as well as Android, iOS, Windows Phone and Blackberry. Files transferred using mobile applications are subject to the same end-to-end encryption as those accessed via the MEGA website, so users can work from multiple devices in confidence. There is also no limit on the number of devices that can be registered to one account, so you can backup from as many computers, mobiles and tablets as you like. Once you’ve registered with MEGA, you have the option to download the MEGAsync client, which allows you to automatically sync files between your computer and your Cloud storage space. Sync also lets you upload and down files directly with MEGA, and significantly increases the speed of your file transfers. All changes made to synchronised files online or on your desktop are implemented in both locations almost instantly. In addition to this, MEGAsync also gives you the option to run a Full Account Sync, which backs up all of the files on your system – making it something of a hybrid of online backup and online storage providers. To share files with other users, you’ll first need to add them to your contact list by entering their email address in the Contacts section of your account. You’ll then need to manually verify their identity, after which you can grant them access to your files. Shared access can take three forms – read only, read/write – in which users can add new files but not remove or edit any existing documents, and full access. You can also share public links to your stored content with anyone, regardless of whether they are MEGA account holders or not. Neither MEGA online nor MEGAsync offers any official file versioning system, although it is possible to access files that have since been overwritten from a hidden debris folder. This isn’t exactly easy to find, however, so will require a bit of an effort to achieve. When it comes to deleted files, anything documents that you remove from MEGA are moved to a recycle bin, from where you can manually restore them at any time. Although still in Beta, MEGAChat is a video messaging service designed to rival Skype, although placing greater emphasis on keeping your conversations private. All communications get the benefit of end-to-end encryption and are available to all account holders – including those with a free subscription. You can also now send encrypted text messages to your contacts as well. In order to get a taste of what is to come, I gave MEGAChat a trial run, and overall, the performance wasn’t bad. While background noises were a little overwhelming when talking in a busy room, the connection was stable and audio quality good, making it worth watching out for when it’s unveiled in its final form. There are also plans for a MEGA-run email service, which once again aims to improve on existing providers by increasing security measures. The project has been delayed due to difficulties developing a user-controlled encryption algorithm that works with the email client, but aims to bring an extra layer of privacy to users’ personal communications. MEGA is all about security, so it’s no surprise that their privacy features are highly developed. Encryption starts on your computer, with keys created on your own device and remaining there; meaning that MEGA is never able to access the information needed to decrypt your data. This is determined by a system of user controlled encryption (UCE) that hands over control of encryption keys to the user, so that even if hackers were able to access your files, they wouldn’t be able to decode their contents. It’s worth noting that, as MEGA never holds your UCE password, if you lose it you won’t be able to get it back – and therefore won’t be able to access your MEGA files. If you’re concerned about this, you can choose to backup your master key, so that you can refresh your memory if an emergency strikes further down the line. As well as applying to files transferred using the MEGA app, UCE is also available for in-browser transfers – a weak point for many other providers when it comes to data security. You will need to use a HTML5 supported browser in order for this to work, however – the best options at present being Mozilla Firefox, Google Chrome, and Opera. UCE is open source, so is open to scrutiny by the wider community. They also use RAID technology to ensure that your data won’t be lost if a server fails, and control staff access to all user backups. When talking about MEGA’s security, the issue of founder Kim Dotcom’s recent withdrawal from the company can’t be avoided, especially as he attributed his exit to concerns that new investors and recent management changes have compromised some of the company’s core principles. For further information, this write-up from TechCrunch gives a good overview of the situation. While Dotcom’s allegations raise some obvious red flags, it is important to note that no substantial evidence has been put forward to support claims that security at MEGA has been changed or compromised in the months surrounding his departure. 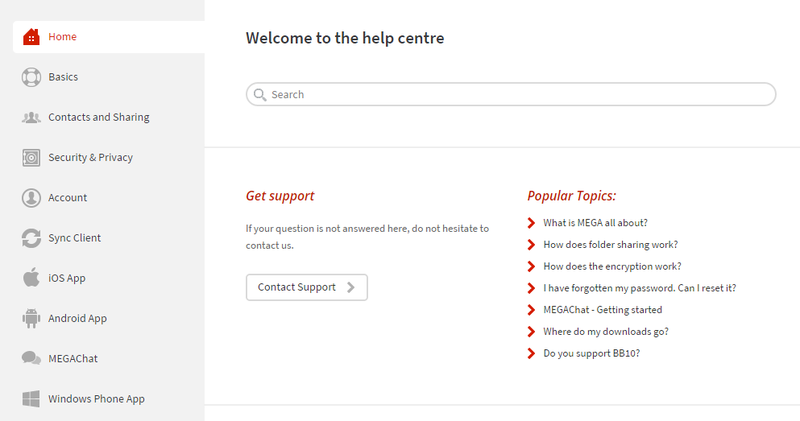 MEGA’s customer support is limited to answers to frequently asked questions in their Help Center, and email support should you want to contact them directly. The Help Center covers a fairly extensive range of subjects and is easy to navigate by selecting your topic or using their search function. Email support is fairly basic (there’s no integrated messaging system, just an address for you to contact from your own email account), but it gets the job done. Having submitted an email support request, I received a reply within two days – not the quickest response I’ve had by a long way, but not the slowest either. Unfortunately for MEGA, in the absence of any live chat or phone support to get problems resolved instantly, the delay has much more of an impact on their overall service than it may have on other providers. When it comes to content, MEGA’s response contained plenty of information, but sadly less clarity. I was given plenty of useful details, but it took some further research on my part to understand the bigger picture. While this may not be the case across the board, it was still somewhat disappointing. MEGA holds Facebook and Twitter accounts, both of which are widely followed despite only adding new content every few weeks. Posts primarily feature company news and promotions, and user comments and requests appear to receive prompt replies. There is also a MEGA blog, which features more in-depth, technical articles than typically featured on social media sites, although here again updates are infrequent. It’s easy to begin using MEGA, as the majority of processes can be run from their website. When you’re first getting started, you don’t even have to register an account – you can just upload files directly to their home page, although it makes sense to get yourself a proper account once you’re confident that you’re happy that you’ve made the right choice. Once you’re signed up, you can download MEGASync. The installation is quick, and you’ll immediately see a pop-up appear on your taskbar, which acts as a control center for all MEGA processes. From there, you can upload and download files and change your account settings, including setting a bandwidth limit and selecting files to exclude from your next backup. On first glance, everything is fairly straightforward, but in practice there were a few issues. To start with, when I tried to upload a folder, it didn’t start syncing automatically – I had to press a few experimental buttons before it really got started (pausing and then resuming worked in the end). There is also a confusing division of features between the desktop client and the MEGA website, with different settings available to change from each location and different ways to access your account information. It’s nothing dreadful, but it does make it more of an uphill struggle to get all of your files backed up and ready to go. MEGA offers a comprehensive app for mobile users*, which is appealingly flexible and easy to navigate. Account holders can upload and download files (including automatically backing up photos from their phone), change settings, share documents, check on their file transfers and even add new contacts just as easily as they can online. It’s clear, easy to install and works well, and has the added bonus of incorporating end-to-end encryption. Impressive. *Two editions of the MEGA app are currently available in most stores – v1 and v2. This review refers to v2, as it is the most up-to-date. MEGA‘s main selling point is its free plan, which offers a very generous amount of storage space as well as access to the majority of features. Unfortunately, bandwidth caps do limit the benefits of so much free space, but extensive security features give the software an additional appeal for users that want to keep more than a few files safe without coughing up for a subscription fee. Kim Dotcom’s involvement and recent withdrawal from the company undeniably raises some troubling questions, but the software itself is solid, with some undeniably strong privacy measures in place. What do you think of MEGA? Leave your views in a comment.